In this study about Heaven, we will focus on the resurrection and rapture of believers and their eternal home. First, let's discuss the differences between the physical and spiritual realms, before taking a look at our future resurrection body. Most people see the physical and spiritual realms as being opposite. In fact, most of the synonyms in the English language for the word "spiritual" are antonyms for the word "physical"; i.e. disembodied, nonphysical, ethereal, and intangible. 2 Kings 6:14-15 - Therefore he sent horses and chariots and a great army there, and they came by night and surrounded the city. And when the servant of the man of God arose early and went out, there was an army, surrounding the city with horses and chariots. And his servant said to him, "Alas, my master! What shall we do?" 2 Kings 6:16-18 - So he answered, "Do not fear, for those who are with us are more than those who are with them." And Elisha prayed, and said, "LORD, I pray, open his eyes that he may see." Then the LORD opened the eyes of the young man, and he saw. And behold, the mountain was full of horses and chariots of fire all around Elisha. So when the Syrians came down to him, Elisha prayed to the LORD, and said, "Strike this people, I pray, with blindness." And He struck them with blindness according to the word of Elisha. In this passage we see an encounter between the physical and spiritual realms. God gave Elisha the ability to see both realms. The servant could not see the spiritual realm, until Elisha prayed that he could. Numbers 22:22-24 - Then God's anger was aroused because he went, and the Angel of the LORD took His stand in the way as an adversary against him. And he was riding on his donkey, and his two servants were with him. Now the donkey saw the Angel of the LORD standing in the way with His drawn sword in His hand, and the donkey turned aside out of the way and went into the field. So Balaam struck the donkey to turn her back onto the road. Then the Angel of the LORD stood in a narrow path between the vineyards, with a wall on this side and a wall on that side. Numbers 22:25-27 - And when the donkey saw the Angel of the LORD, she pushed herself against the wall and crushed Balaam's foot against the wall; so he struck her again. Then the Angel of the LORD went further, and stood in a narrow place where there was no way to turn either to the right hand or to the left. And when the donkey saw the Angel of the LORD, she lay down under Balaam; so Balaam's anger was aroused, and he struck the donkey with his staff. Numbers 22:28-31 - Then the LORD opened the mouth of the donkey, and she said to Balaam, "What have I done to you, that you have struck me these three times?" And Balaam said to the donkey, "Because you have abused me. I wish there were a sword in my hand, for now I would kill you!" So the donkey said to Balaam, "Am I not your donkey on which you have ridden, ever since I became yours, to this day? Was I ever disposed to do this to you?" And he said, "No." Then the LORD opened Balaam's eyes, and he saw the Angel of the LORD standing in the way with His drawn sword in His hand; and he bowed his head and fell flat on his face. In the story of Balaam and his donkey, we can draw similar conclusions to those in the story of Elisha. We see that until God gave the ability to do so, Balaam was unable to see the spiritual realm. Even though he was unable to see the spiritual realm, there was a real angel with a real sword ready to strike Balaam dead. It is interesting to note, that the donkey could see the angel. We are not told whether the donkey could see the spiritual realm in just this particular case, or if animals in general are able to see the spiritual realm, unlike most humans. Animals have thought to have a "sixth sense" that humans don't have. Perhaps this "sixth sense" is, in reality, the ability to see beyond what we call the "physical realm." Moses beheld the Glory of God and spoke with Him audibly (Exodus 34:29-35). Ezekiel saw the four living creatures with the flying wheels (Ezekiel 1). An angel came to Mary and announced she would conceive Jesus (Luke 1:26-38). The shepherds saw angels after Jesus was born (Luke 2:8-14). Three disciples saw Jesus in His Glory, along with Moses and Elijah at the "Transfiguration"
The veil between the two realms will go away at the 2nd Coming of Jesus, when the whole world will visibly see His return with the heavenly hosts (Revelation 19). We can see that the spiritual realm coincides in space and time with our physical realm, but it doesn't have the same limitations that the physical realm does. It is also important to realize that just because we cannot see the spiritual realm, it doesn't mean that it isn't real. In fact, as demonstrated in the biblical examples, the spiritual realm is more real than we imagine. Most of us are blind to the spiritual realm in our physical bodies; possibly as part of the curse that came after the fall back in Genesis. We will touch on this concept of "spiritual versus physical" again in the next two studies about Heaven. 1 Corinthians 15:42-45 - So also is the resurrection of the dead. The body is sown in corruption, it is raised in incorruption. It is sown in dishonor, it is raised in glory. It is sown in weakness, it is raised in power. It is sown a natural body, it is raised a spiritual body. There is a natural body, and there is a spiritual body. And so it is written, "The first man Adam became a living being." The last Adam became a life-giving spirit. 1 Corinthians 15:46-49 - However, the spiritual is not first, but the natural, and afterward the spiritual. The first man was of the earth, made of dust; the second Man is the Lord from heaven. As was the man of dust, so also are those who are made of dust; and as is the heavenly Man, so also are those who are heavenly. And as we have borne the image of the man of dust, we shall also bear the image of the heavenly Man. 1 Corinthians 15:50-52 - Now this I say, brethren, that flesh and blood cannot inherit the kingdom of God; nor does corruption inherit incorruption. Behold, I tell you a mystery: We shall not all sleep, but we shall all be changed - in a moment, in the twinkling of an eye, at the last trumpet. For the trumpet will sound, and the dead will be raised incorruptible, and we shall be changed. 1 Corinthians 15:53-54 - For this corruptible must put on incorruption, and this mortal must put on immortality. So when this corruptible has put on incorruption, and this mortal has put on immortality, then shall be brought to pass the saying that is written: "Death is swallowed up in victory." gratification, or state of absolute happiness. 3. Raised a spiritual body; which means sanctified, holy, redeemed, or inviolable. 4. Heavenly; which means unearthly, or paradisiacal. 1 Corinthians 15:20-23 - But now Christ is risen from the dead, and has become the firstfruits of those who have fallen asleep. For since by man came death, by Man also came the resurrection of the dead. For as in Adam all die, even so in Christ all shall be made alive. But each one in his own order: Christ the firstfruits, afterward those who are Christ's at His coming. Luke 24:28-31 - Then they drew near to the village where they were going, and He indicated that He would have gone farther. But they constrained Him, saying, "Abide with us, for it is toward evening, and the day is far spent." And He went in to stay with them. Now it came to pass, as He sat at the table with them, that He took bread, blessed and broke it, and gave it to them. Then their eyes were opened and they knew Him; and He vanished from their sight. Luke 24:32-35 - And they said to one another, "Did not our heart burn within us while He talked with us on the road, and while He opened the Scriptures to us?" So they rose up that very hour and returned to Jerusalem, and found the eleven and those who were with them gathered together, saying, "The Lord is risen indeed, and has appeared to Simon!" And they told about the things that had happened on the road, and how He was known to them in the breaking of bread. Luke 24:36-42 - Now as they said these things, Jesus Himself stood in the midst of them, and said to them, "Peace to you." But they were terrified and frightened, and supposed they had seen a spirit. And He said to them, "Why are you troubled? And why do doubts arise in your hearts? Behold My hands and My feet, that it is I Myself. Handle Me and see, for a spirit does not have flesh and bones as you see I have." When He had said this, He showed them His hands and His feet. But while they still did not believe for joy, and marveled, He said to them, "Have you any food here?" So they gave Him a piece of a broiled fish and some honeycomb. John 20:11-14 - But Mary stood outside by the tomb weeping, and as she wept she stooped down and looked into the tomb. And she saw two angels in white sitting, one at the head and the other at the feet, where the body of Jesus had lain. Then they said to her, "Woman, why are you weeping?" She said to them, "Because they have taken away my Lord, and I do not know where they have laid Him." Now when she had said this, she turned around and saw Jesus standing there, and did not know that it was Jesus. John 20:15-17 - Jesus said to her, "Woman, why are you weeping? Whom are you seeking?" She, supposing Him to be the gardener, said to Him, "Sir, if You have carried Him away, tell me where You have laid Him, and I will take Him away." Jesus said to her, "Mary!" She turned and said to Him, "Rabboni!" (which is to say, Teacher). Jesus said to her, "Do not cling to Me, for I have not yet ascended to My Father; but go to My brethren and say to them, 'I am ascending to My Father and your Father, and to My God and your God.'" We see again in this passage that Jesus' resurrected body must have looked like a normal physical body. Mary, however, did not recognize him at first. At a conference I attended, prophecy teacher Dr. David Reagan said something to the effect: "If you died and I performed your funeral and you came knocking on my door the next day, I would tell you that you look like someone I knew that just died!" In other words, there is no need to read too much into why Mary didn't recognize Jesus right away, especially since she recognized Him when she heard His voice. The failure to recognize Jesus may have just been because Mary was weeping and couldn't see clearly. John 20:19-20 - Then, the same day at evening, being the first day of the week, when the doors were shut where the disciples were assembled, for fear of the Jews, Jesus came and stood in the midst, and said to them, "Peace be with you." When He had said this, He showed them His hands and His side. Then the disciples were glad when they saw the Lord. John 20:26-28 - And after eight days His disciples were again inside, and Thomas with them. Jesus came, the doors being shut, and stood in the midst, and said, "Peace to you!" Then He said to Thomas, "Reach your finger here, and look at My hands; and reach your hand here, and put it into My side. Do not be unbelieving, but believing." And Thomas answered and said to Him, "My Lord and my God!" Revelation 21:5 - Then He who sat on the throne said, "Behold, I make all things new." And He said to me, "Write, for these words are true and faithful." John 21:7-9 - Therefore that disciple whom Jesus loved said to Peter, "It is the Lord!" Now when Simon Peter heard that it was the Lord, he put on his outer garment (for he had removed it), and plunged into the sea. But the other disciples came in the little boat (for they were not far from land, but about two hundred cubits), dragging the net with fish. Then, as soon as they had come to land, they saw a fire of coals there, and fish laid on it, and bread. John 21:10-13 - Jesus said to them, "Bring some of the fish which you have just caught." Simon Peter went up and dragged the net to land, full of large fish, one hundred and fifty-three; and although there were so many, the net was not broken. Jesus said to them, "Come and eat breakfast." Yet none of the disciples dared ask Him, "Who are You?" - knowing that it was the Lord. Jesus then came and took the bread and gave it to them, and likewise the fish. Why is Christ's resurrection from the dead so important? 1 Corinthians 15:12-16 - Now if Christ is preached that He has been raised from the dead, how do some among you say that there is no resurrection of the dead? But if there is no resurrection of the dead, then Christ is not risen. And if Christ is not risen, then our preaching is empty and your faith is also empty. Yes, and we are found false witnesses of God, because we have testified of God that He raised up Christ, whom He did not raise up-if in fact the dead do not rise. For if the dead do not rise, then Christ is not risen. 1 Corinthians 15:17-22 - And if Christ is not risen, your faith is futile; you are still in your sins! Then also those who have fallen asleep in Christ have perished. If in this life only we have hope in Christ, we are of all men the most pitiable. But now Christ is risen from the dead, and has become the firstfruits of those who have fallen asleep. For since by man came death, by Man also came the resurrection of the dead. For as in Adam all die, even so in Christ all shall be made alive. The passage above pretty much speaks for itself. If Christ did not rise from the dead, our "faith is futile," and we are "still in our sins." Since Christ did rise from the dead, we will be "made alive" again in our own resurrection from the dead. Amen! Philippians 3:20-21 - For our citizenship is in heaven, from which we also eagerly wait for the Savior, the Lord Jesus Christ, who will transform our lowly body that it may be conformed to His glorious body, according to the working by which He is able even to subdue all things to Himself. Revelation 1:12-17 - Then I turned to see the voice that spoke with me. And having turned I saw seven golden lampstands, and in the midst of the seven lampstands One like the Son of Man, clothed with a garment down to the feet and girded about the chest with a golden band. His head and hair were white like wool, as white as snow, and His eyes like a flame of fire; His feet were like fine brass, as if refined in a furnace, and His voice as the sound of many waters; He had in His right hand seven stars, out of His mouth went a sharp two-edged sword, and His countenance was like the sun shining in its strength. And when I saw Him, I fell at His feet as dead. But He laid His right hand on me, saying to me, "Do not be afraid; I am the First and the Last." Unlike the disciples communing with Jesus like any ordinary man in His resurrection body, John was unable to behold, let alone speak, when He saw Jesus in His glorified body. John fainted at the sight of Him! Clearly a glorified body is much more than just a resurrection body. When will we be able to behold Christ's glory? 1 John 3:2 - Beloved, now we are children of God; and it has not yet been revealed what we shall be, but we know that when He is revealed, we shall be like Him, for we shall see Him as He is. Christ will reveal Himself to the Church at the rapture, when the saint receive resurrection bodies (1 Corinthians 15:50-54). Also, at the rapture the resurrected Church will become glorified like Christ (Romans 8:17-19). Revelation 1:12-17 shows that Jesus' glorified body was radiant and powerful. We will wear white like our Savior, at least through the Tribulation period (Revelation 19:7-8, 14). Perhaps we will even have white hair like His. Our presence may even overwhelm people in their physical bodies. That is unless the lifting of the curse allows mortals to behold such things again (Isaiah 65). In short, our glorified bodies will be like Jesus' glorified body, radiant and clothed in white raiment. John 14:2-6 - In My Father's house are many mansions; if it were not so, I would have told you. I go to prepare a place for you. And if I go and prepare a place for you, I will come again and receive you to Myself; that where I am, there you may be also. And where I go you know, and the way you know. "Thomas said to Him, "Lord, we do not know where You are going, and how can we know the way?" Jesus said to him, "I am the way, the truth, and the life. No one comes to the Father except through Me." Ephesians 5:31-32 - "For this reason a man shall leave his father and mother and be joined to his wife, and the two shall become one flesh." This is a great mystery, but I speak concerning Christ and the church. As just mentioned, Jesus said in John 14 He will take us to His Father's house. The only other passage in Scripture that describes this heavenly abode is in Revelation 21. As you read through the following passage and ponder what Jesus said in John, think about the things that make this heavenly city feel like home. What about these passages do not feel like home? 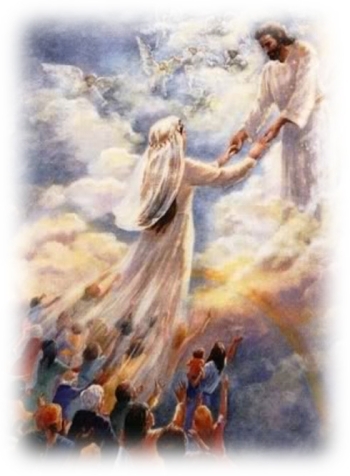 Revelation 21:9-11 - Then one of the seven angels who had the seven bowls filled with the seven last plagues came to me and talked with me, saying, "Come, I will show you the bride, the Lamb's wife." And he carried me away in the Spirit to a great and high mountain, and showed me the great city, the holy Jerusalem, descending out of heaven from God, having the glory of God. Her light was like a most precious stone, like a jasper stone, clear as crystal. Revelation 21:12-15 - Also she had a great and high wall with twelve gates, and twelve angels at the gates, and names written on them, which are the names of the twelve tribes of the children of Israel: three gates on the east, three gates on the north, three gates on the south, and three gates on the west. Now the wall of the city had twelve foundations, and on them were the names of the twelve apostles of the Lamb. And he who talked with me had a gold reed to measure the city, its gates, and its wall. Revelation 21:16-18 - The city is laid out as a square; its length is as great as its breadth. And he measured the city with the reed: twelve thousand furlongs. Its length, breadth, and height are equal. Then he measured its wall: one hundred and forty-four cubits, according to the measure of a man, that is, of an angel. The construction of its wall was of jasper; and the city was pure gold, like clear glass. Revelation 21:19-21 - The foundations of the wall of the city were adorned with all kinds of precious stones: the first foundation was jasper, the second sapphire, the third chalcedony, the fourth emerald, the fifth sardonyx, the sixth sardius, the seventh chrysolite, the eighth beryl, the ninth topaz, the tenth chrysoprase, the eleventh jacinth, and the twelfth amethyst. The twelve gates were twelve pearls: each individual gate was of one pearl. And the street of the city was pure gold, like transparent glass. Revelation 21:22-27 - But I saw no temple in it, for the Lord God Almighty and the Lamb are its temple. The city had no need of the sun or of the moon to shine in it, for the glory of God illuminated it. The Lamb is its light. And the nations of those who are saved shall walk in its light, and the kings of the earth bring their glory and honor into it. Its gates shall not be shut at all by day (there shall be no night there). And they shall bring the glory and the honor of the nations into it. But there shall by no means enter it anything that defiles, or causes an abomination or a lie, but only those who are written in the Lamb's Book of Life. It would be surprising if anyone saw the comforts of home in the passage above. The New Jerusalem is beyond our comprehension. However, if you go back to the passage in John 14:2-6, Jesus tells us that He is preparing a place just for you in that glorious city. Your Creator knows you better than anyone else in the universe, so be assured that your "mansion" will have things that suit your desires, preferences, and interests. I imagine we will feel like we have always been there and belong there. The New Jerusalem is our destiny. We can only begin to imagine what the Lord has in store for us there.